I have had this piece for quite some time now, but I have not had a chance to actually review it. 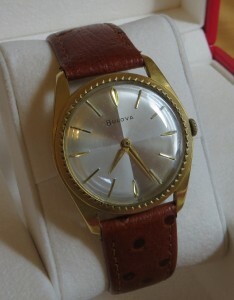 It is a Bulova dress watch from 1960. It has an M0 date code. The dial is wonderfully simple, silver, with alternating finishing at the cardinal points. The hour markers are gold plated applied sticks, except for 12, 3, 6, and 9 o’clock, which are diamond shaped. There is no luminescent material anywhere. The dial is only marked Bulova and Swiss. Clean and simple. The hands are gold plated lancette, hour and minute only. I am not sure if this watch ever had a second hand, but it is long gone in the last 53 years. There is no chapter ring, but the bezel has 60 flutes for the minute markers. The crystal is domed acrylic and required very little polishing. The lack of lume is probably a saving grace of this watch, since there was none to degrade, the dial is in amazing condition. It is hard to believe this watch was made when Eisenhower was president! The case is base metal(?) with a very healthy gold plating. Being a hand wound watch, it is pretty darn thin. 0.205 inches (5.25mm), without the crystal, 0.355 inches (9mm) thick, with the crystal. The lugs are 19mm, so pretty easy to find a replacement band. The crown is unsigned and quite brassed over, really no gold left on there. To be expected with a hand wound watch half a century old. 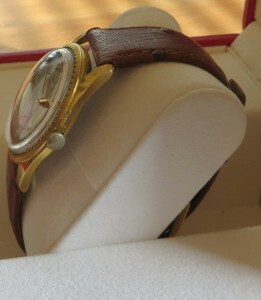 The watch is currently on ostrich pattern leather and suits the watch well. The case back is screw down and stainless steel. Simply marked on the outside with Bulova Swiss. 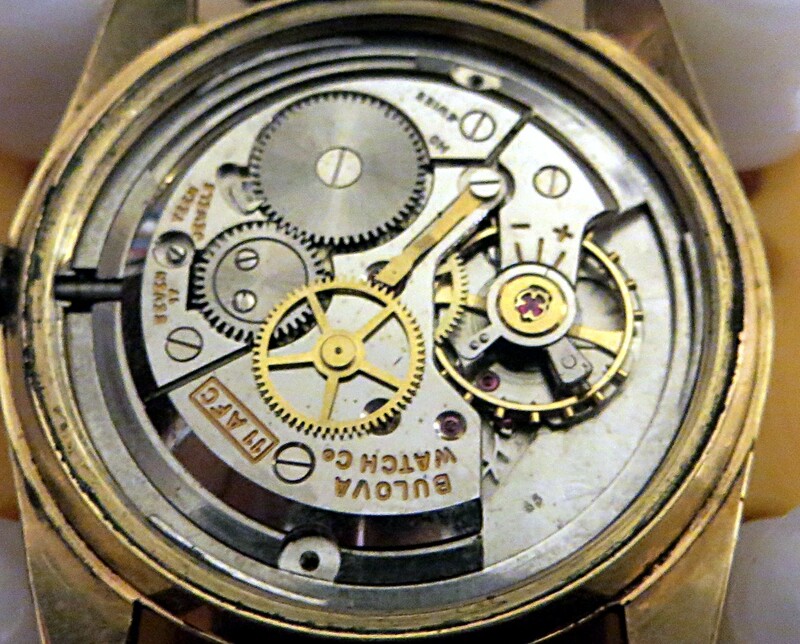 The movement is a work of art, an 11 AFC, 17 jewels, made in Switzerland. The plates gleam like they are brand new and the gear train appears to be possibly gold plated, or brass with a hell of a shine. The balance has micro adjustment screws and shock protected jewels. It is a shame this watch does not have a seconds hand, it appears to be very accurate, but is hard to tell without the running seconds hand. There is no markings of the last service date. The movement is held in place with a metal spacer ring. 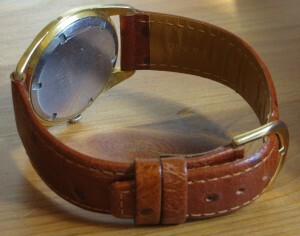 This was a very nice quality watch when it was produced. All in all, a very nice dress watch to wear. It keeps excellent time, is fairly thin, and easy to read. It has no complications, but, it is the lack of gimmicks makes this watch a real classic. Sometimes I wonder about what history this watch has seen. Is the original owner still alive? (Probably not.) Was someone wearing it when man landed on the moon? Was it worn to their or or a daughter’s wedding? Who is to know? I know that I will take care of this little machine until I can pass it down to my own son. Case: 34mm, gold plates base or stainless. Movement: Bulova 11 AFC, 18,000 BPH movement, 17 jewels Swiss Made, shock protected, hand wind. Other: On Ostrich Pattern leather band, 19 mm lugs.